A couple of years ago, a ministry in the Middle East asked me to come and teach a week of discipleship training. I’d been there once before and had loved connecting with the people, so I immediately said yes. Never mind that my calendar was already booked with teaching in Nepal for three weeks the month prior, followed by speaking at a Canadian women’s retreat. Accepting the Middle Eastern invitation would mean flying halfway around the world twice in five days: Nepal – Canada – Egypt. I know, I know—saying yes was a bad idea, but I didn’t think so at the time. After all, my heart was in the right place. I wanted to encourage new believers in their faith journey, and I believed God would give me the strength necessary to travel thousands of miles to do it. There was only one problem: I didn’t ask God for His opinion before I said yes. King David did the same thing. He felt badly that he was living in a cedar palace while the Ark of the Lord’s covenant sat outside in a tent. He felt that God deserved better so he thought about building a magnificent temple where He could dwell. David’s heart was in the right place. He loved God and wanted to honor Him. He even talked to Nathan the prophet about his idea and received his blessing to proceed. But God had other plans. 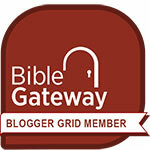 He’d chosen David to lead His people for a time, and He’d appointed Solomon to build the temple (1 Chronicles 17:1-15). Using Nathan as a mouthpiece, God put a stop to David’s good intentions. God put a stop to my well-meaning plans too. Security issues in the Middle East became a concern two weeks before my scheduled flight, and the discipleship training was put on hold. The sudden turn of events meant canceling my airline ticket, and doing so cost several hundred dollars. In retrospect, I believe I could have saved myself a lot of unnecessary stress and expense if only I’d taken the time to consult God before making my own plans. 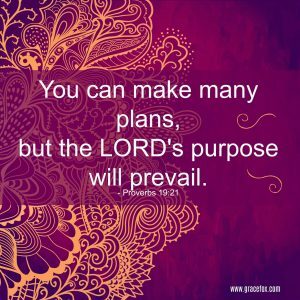 Proverbs 19:21 says, “You can make many plans, but the Lord’s purpose will prevail.” This verse has become foundational for me since my Middle Eastern experience. Now I understand the importance of talking with God before making decisions no matter how honorable they seem. Have you ever done something like that? Your heart was in the right place. You meant well. You truly wanted to honor the Lord, so you stepped into something that seemed like a good idea at the time but neglected to talk to God about it first. If so, did God step in and thwart your plans or did He allow you to move forward with them? What happened?